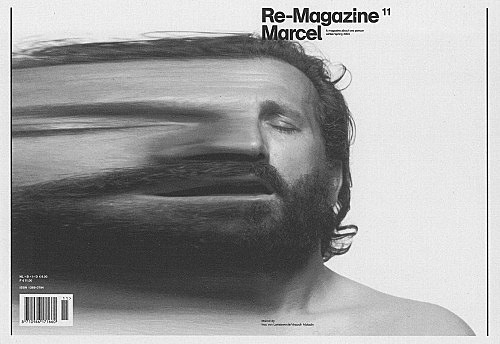 ‘A magazine about one person’ is the subtitle of the last three issues of Re-Magazine. John (#9), Claudia (#10) and Marcel (#11) present themselves with stories about their lives and are represented in the magazine with pictures shot by renowned photographers. The stories of John, Claudia and Marcel are all very different, but have an outspoken and obsessive attitude towards life in common. John is involved in the act of disappearing from his own life, Claudia combines an overdose of beauty, intelligence, success and well-being in an incredible 200 cm tall body and Marcel weighs nearly 100 kilos and uses his body as an arena where he stages a clash between all the contradictions in our nowadays relationship with food. Clearly, you don’t find people like this in daily life situations, which is not surprising since John, Claudia and Marcel are fictitious characters. Re-defining the word model, they combine visual representation and editorial content in one. In the back of each issue it is revealed how they are constructed and rooted in reality by the editors of Re-Magazine. Re-Magazine’s development into this format of creating one fictitious person in order to deal with aspects of life in an over-mediated society has known various stages. Manic Issue, Boring Issue, Difficult Magazine, Anti-Attitude Issue, are some of the magazine’s subtitles before it became a magazine about one person. And fictitious elements have been present over a longer period of time. In #8 – the 2007 issue and therefore advertised as #23 – an anonymous group of people confess how major political, economical or religious changes in world history, from the late nineteen seventies to the year 2007, have effected their personal lives. Talking in plural, from a point of view in the near future, they seem to have given up individual identity without even questioning it, or explaining it to the readers in the year 2002. This image of the future is in radical contrast with the content of #5, the Information Trash-can, where an unidentified person starts a monologue by saying: ‘Listen, I can explain everything’. What follows is a recollection of all his wasted thoughts in I-speak, not being able to break out of his solipsistic mind, or able to find escapes from his hyper-awareness caused by the data pipeline called ‘media’. The character is stuck in a paradox that at the very same time is a major drive for the magazine in general. Being part of the media landscape itself, Re-Magazine uses a trojan horse strategy to come to terms with modern life’s hyper-awareness created by the media. This search for unmediated experiences and alternatives for the devaluation of media-images makes Re-Magazine a magazine that is constantly reformulating its own critical position. Re-Magazine, a magazine about one person, started as a magazine made by one person. It was founded by graphic designer Jop van Bennekom in 1997. Looking for new media strategies, he became designer and editor in one and took the banality of his own life as a source. Instead of transforming the reality of this daily life into a media illusion full of seductive images that always invite you but never let you in, van Bennekom represented daily life as plain and as trivial as he knew it by interviewing his friends and relatives, chatting about their home situation. From then on van Bennekom used the following issues as a tool to create a collaborative network of editors, artists and photographers, such as Wolfgang Tillmans, Inez van Lamsweerde/Vinoodh Matadin,Terry Richardson, Viviane Sassen and Anuschka Blommers/Niels Schumm. Arnoud Holleman, co-editor, artist and writer, joined van Bennekom in 1998. Nowadays Re-Magazine is distributed worldwide.